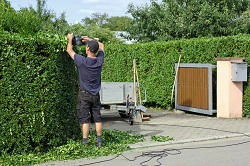 Hedge trimming and pruning can be a particularly difficult task, so why struggle on your own. Even with a step ladder and that old rusty hedge trimmer from the garage it can be a real ordeal so simply allow our fantastic gardening professionals to do it for you. For our reliable gardening team no job is too big or too small and we will have to your garden looking neat and tidy in no time with state of the art equipment and years of experience. We don’t just take part in trimming and pruning, but our gardening experts are proficient in all forms of London garden design. In our years of experience we have encountered a number of different designs, spaces and options so we can create the perfect space for you. Simply call 020 8434 7256 today to discuss all of your options and requirements and we can make that you have everything that you need in the back garden. Not only do we do all of the work but we will whip around your garden and do anything else that needs doing such as garden spraying, planting, leaf clearance and any lawn maintenance. And that’s not all, once we have finished we will also do all of the garden waste removal too leaving you with a clean, tidy and attractive garden ready for summer. For a free quote for your requirements simply get in touch with London Gardeners on 020 8434 7256 right now and we will be delighted to help you. So don’t worry about getting outside and working hard in those precious sunny hours, you can let us do all of the work and you can sit and relax with a nice cold drink. If you’ve got bushes that are overgrown, weeds that need digging up or any other pruning or hedge trimming work our garden experts will have it completed in a flash and have all of the rubbish away in the blink of an eye. You will be amazed at what our garden maintenance services can do to give you perfect lawns and landscaping work. At London Gardeners we believe in providing an unbeatable service that offers flexible pricing structure, a regular appointment system that can be altered at any time, fantastic customer service and 100% satisfaction guaranteed. So if you are in need of a reliable gardening team that will not let you down then look no further than our fantastic gardening professionals. When it comes to garden design there is really no-one finer and our prices are the very best in London. You don’t need to worry about a thing because our garden maintenance services will keep on top of everything with a regular appointment slot to quickly make sure everything is looking perfect. Some of our customers love the fact that they can throw a BBQ or party at short notice because they don’t have to worry about clearing up the garden first. Other customers have used us just to help their elderly parents with a few of the hard to reach areas of the garden to prevent them from stretching and straining. We really care about the work that we do and we are passionate about delivering great gardens so for a one off garden clean up or a regular hedge trimming service simply call us today. Call 020 8434 7256 today to obtain our fantastic gardening care services and enjoy the summer in a beautiful garden. You really won’t regret using our conscientious local professionals, so call us now and we would be delighted to hear from you.